I'm a little late on posting my Christmas goodie for my kids, but it's something you can do any time of the year including birthdays or even a nice New Year's back to school surprise. Most of you have probably seen Wordle and others like it floating around on Pinterest, but for those of you who don't know what it is, Wordle is awesome! It is a very simple program that you type a word list into and it creates a "word cloud." The more times you repeat a specific word, the larger that word is in relation to the others, and you can spend tons of time playing with color variations, font styles, and layouts. Last year I used Wordle to make rectangular bookmarks that I laminated using phrases to describe each child, our grade, school, and other fun facts, with their name repeated most frequently to make it the biggest. The past few years I've been a bit of a scrooge because it drives me crazy when I spend time handmaking something and proudly giving it to the students only to find it crushed, trashed, or otherwise! Well, that did not happen with these bookmarks last year- the kids kept them for the entire rest of the year and used them. They were so appreciative and gave me the confidence to spread the niceness again this year. Our school gave us iPads this year and I figured there must be an App by now. I didn't find Wordle exactly, but rather "Visual Poetry." This app enables you to select different shapes and letters. 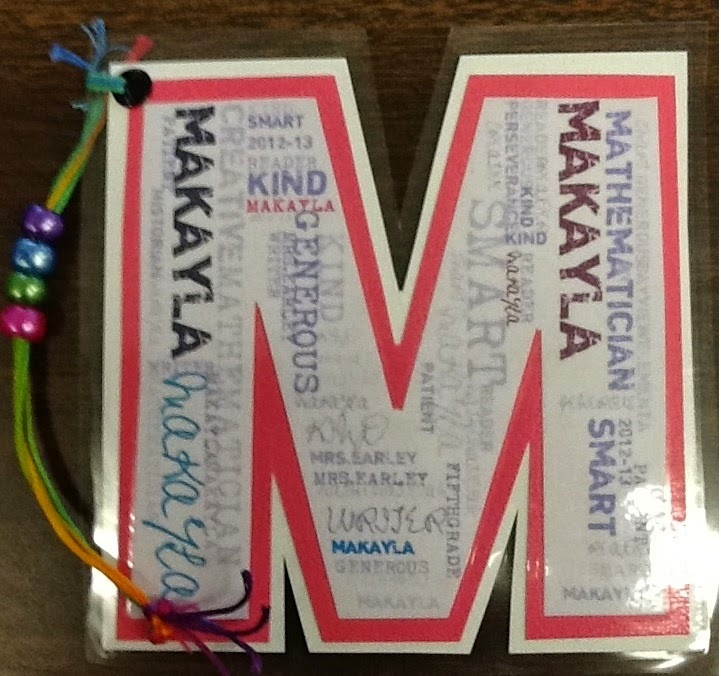 I wanted to use students' first letters to make their bookmark this year. Wow was this easy! It took all of about 20 minutes to make all of their letters using the copy/paste feature. The time consuming part was matting, laminating and cutting, but somehow this proved to be a relaxing and mindless break that was greatly needed. I punched holes, added a few beads on a string, stuck candy canes on them, and the kids were thrilled again. (After checking it out today, I see they have Christmas shapes too!) The $0.99 was well worth it! Even better- the kids were DYING to know how I had done it. I showed them the App and also Wordle so others could access the similar program on the class computers. They turned this into a whole new lesson! One group made a thank you for the local meteorologist who had visited our classroom and he showed their Wordle on the news (we had it framed--shown is a screenshot). The group that had my iPad, secretly made one for me (The red, green, and blue heart below). On our last day together, we had a crafty day (I know, in fifth grade?- how dare we????) and they were begging to use Wordle to make Christmas cards for their family. It was the quietest, most relaxing day I've had with them all year! I have now made Wordle an ongoing part of extra credit in our weekly newsletter. Students can take a concept we are working on in science, a character we are focusing on, or a math concept and create a Wordle with at least 20 different terms strategically repeated depending on importance. It's so fun, they don't even know they're thinking!